Spa owner and habitual amateur sleuth Penny Brannigan finds herself at a clerical conference at Gladstone's Library in North Wales. Also attending as a guest speaker is her boyfriend, DCI Gareth Davies, there to give a talk on theft prevention. But behind the ornate red sandstone facade of this most respectable of Victorian buildings, Penny encounters deception, blackmail, and murder. When the bishop's secretary dies of a suspicious case of food poisoning, Davies leads the investigation. 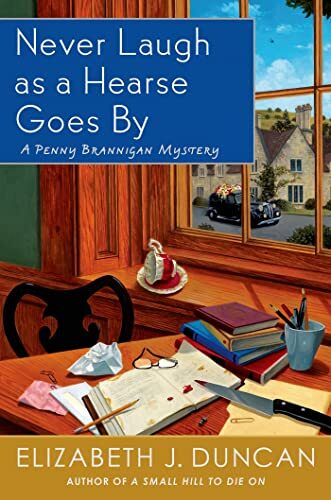 At Penny's suggestion, Florence Semble, a friend from Penny's adopted hometown, is invited to the Library to decode the secretary's shorthand notebook in the search for clues. As the conference continues, another body is found in the beautiful Library itself, and Penny must once again search for a killer. Elizabeth J. Duncan's Never Laugh as a Hearse Goes By is a fine entry in a series celebrated for its small-town charm, Welsh flavor, and lovable characters. About the Author&colon; Elizabeth J. Duncan, author of the Penny Brannigan mysteries, including The Cold Light of Mourning, A Brush with Death, A Killer's Christmas, in Wales is a winner of the 2013 Bloody Words Light Mystery Award and has been a finalist for the Agatha and Arthur Ellis Awards. She enjoys spending time each year in North Wales and lives with her dog Dolly in Toronto, where she teaches in the public relations programs at Humber College.